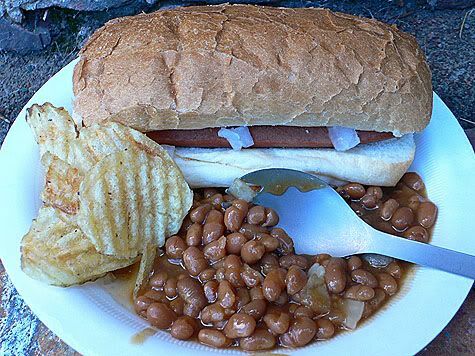 Here’s a picture of one of our first camping meals. 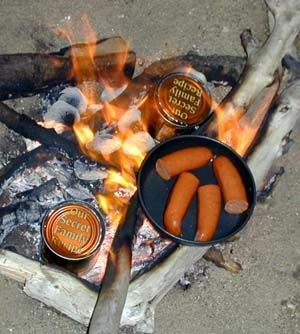 We paddled in kayaks across Tomales Bay out to a secluded beach, setup the tent, built a fire on the beach using found wood, and proceeded to cook (well heat up canned beans and some hotdogs). 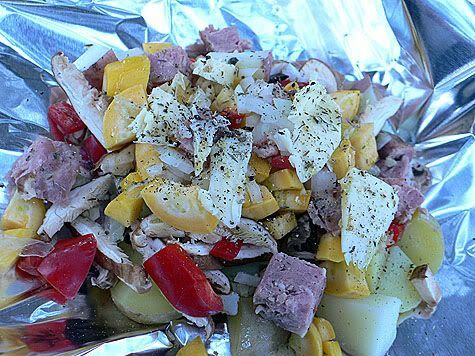 It was very basic but delicious and incredibly easy… When you are cooking on the road, one tends to go for convenience and this is where we are allowed to eat straight out of bottles and cans. 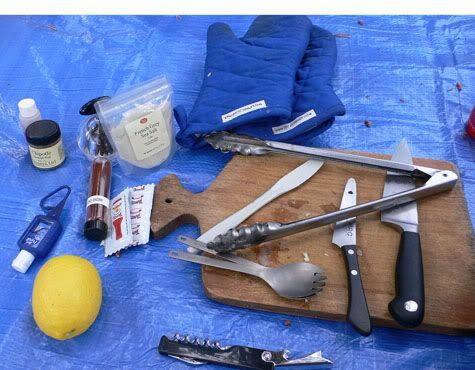 Over time, I have learned that there are a few essentials that I must bring with me to complete my camping kitchen, since you probably could tell that I am not a backpack type of camper, I am more of a car-camper and like my creature comforts… My basic survival kit includes a couple of knives, salt, a small pepper grinder, tongs, hot mitts, a wooden cutting board, a few little containers of spices, and I have some very small nalgene containers that I fill with extra virgin olive oil, balsamic vinegar. 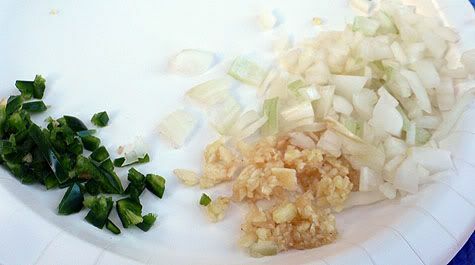 If I have time I grab handfuls of fresh herbs from the garden and wrap them in a paper towel then put in a plastic bag, pick lemons from the tree, and bring along any of the small condiments you get with takeout food (I always save soy sauce and hot sauce). 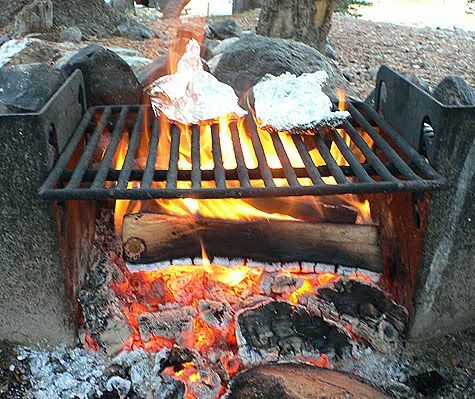 This takes up very little space and can make a huge difference on the quality of meals eaten at the campfire. 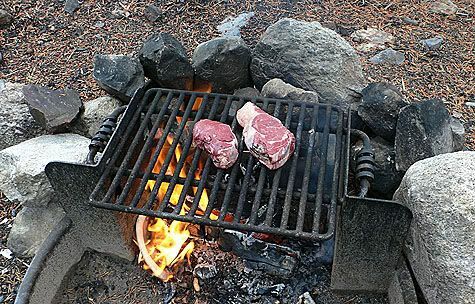 Roughing it, doesn’t mean you have to limit yourself to beef jerky and top ramen. 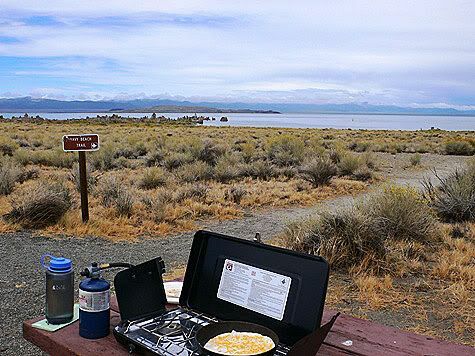 We also have a very fine gas stove that is key for heating up water for coffee and also I use for some rudimentary cooking, like heating up tortillas for quesadillas. For pans, we have a nested set of 3 pots with matching tops that double as fry pans. 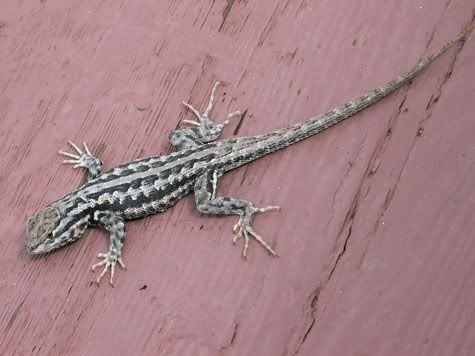 They are very thin so cooking on them requires constant vigilance. 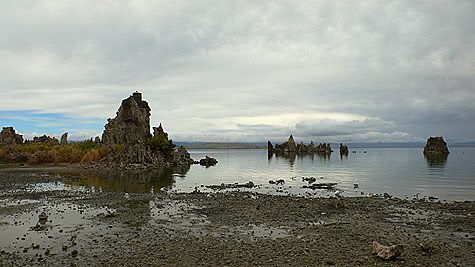 We were trying to outrun the rain in Yosemite and drove east to Mono Lake’s South Tufa area. It stopped raining while we were there but made for very moody and dramatic skies. 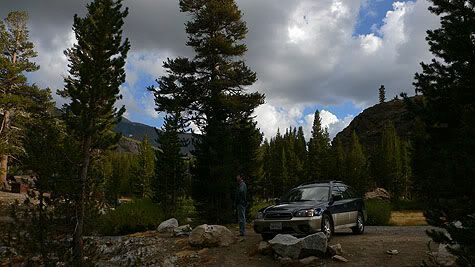 After we trudged through the tufa, we decided to setup shop in the picnic area by the beach. 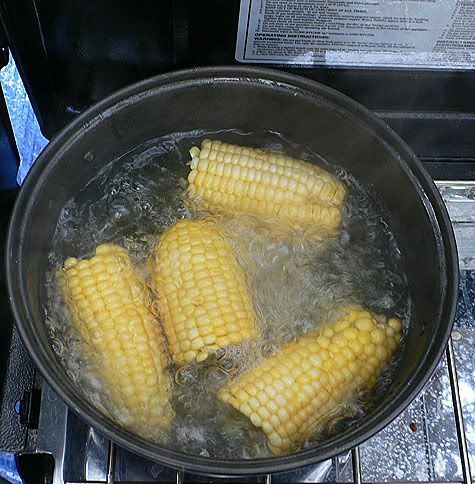 This is our first meal cooked in the great outdoors. 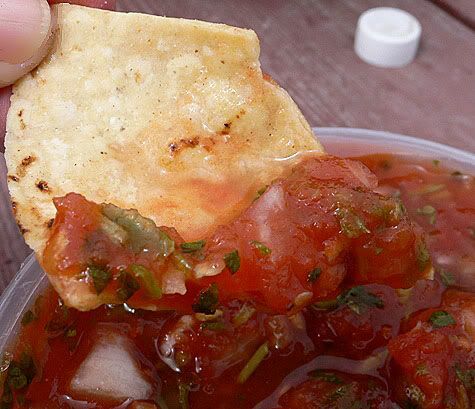 Chips and salsa are very good to munch on while waiting for the rest of the food to heat up. 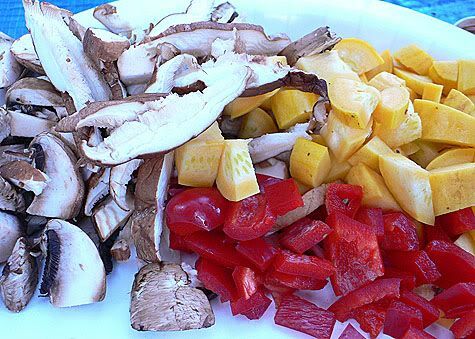 Yes indeed, this is hardly cooking, but it does constitute a hot meal and is very satisfying! 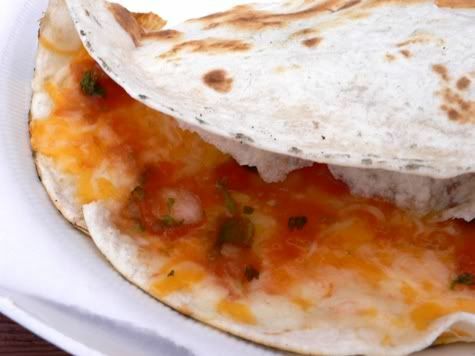 Once the cheese is melted, the tortilla develops a delicious crunch and breaks a little when you fold it over, but you can hold it in your hands while eating it. And this guy with his inscrutable expression – I’m not sure if we interrupted his nap or he was waiting for some crumbs… he was the closest I got to the wildlife on this trip. 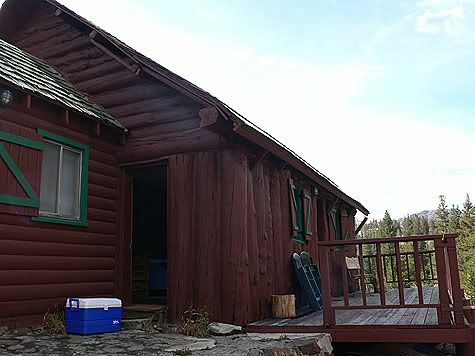 That night, we were wimps because of the rain and stayed at a nearby rustic lodge where we huddled on the patio and cooked dinner on our gas grill. Mr. K resolutely refuses to camp in the rain… I think he must have had a traumatic camping experience some time in his past. 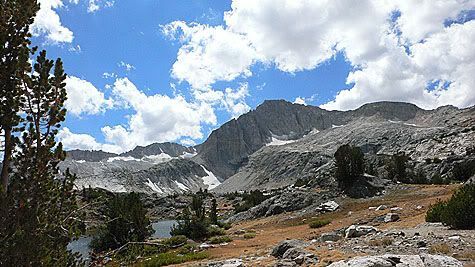 The next two nights were spent at an actual campsite in a tent, where we had a super duper bear repellant food locker. It was large enough to fit the cooler and many bags of food and sundries (and I must be some sort of distant relative as I was unable to open it without assistance). 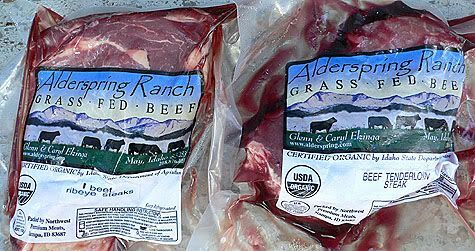 Grassfed meat requires more attention in order to maintain its tenderness and juiciness, as they are way less fatty (the fat acts as an insulator during the cooking process to help keep the juices from cooking away). 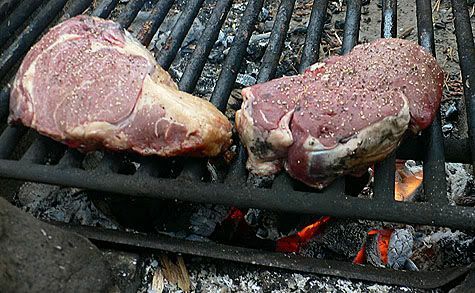 With this in mind, we kept the grill up high from the coals and were aiming for the slow cooking over indirect heat. and they were mighty crispy on the one side when we got back and rebounded with rubbery glee when we pressed against the charred side with the tongs…. 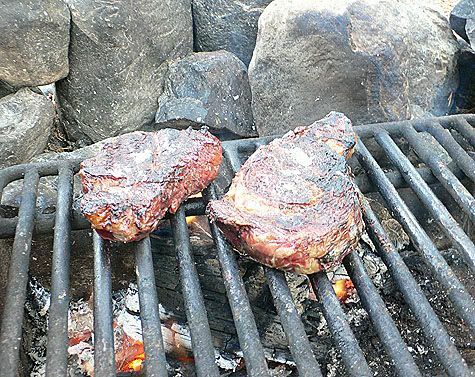 But amazingly, with what can only be attributed to the Flintstonian portions of the meat, they survived our neglect remarkably! 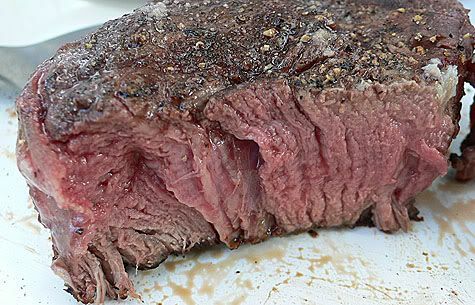 Here’s the tenderloin which almost melted in your mouth. 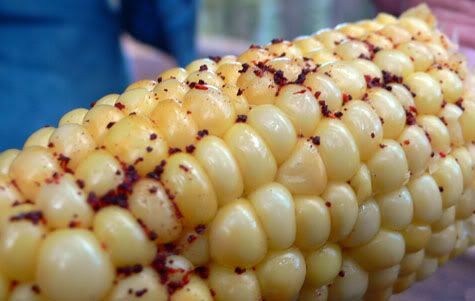 Mr. K likes to eat corn drizzled with lemon and sprinkled with chile powder. 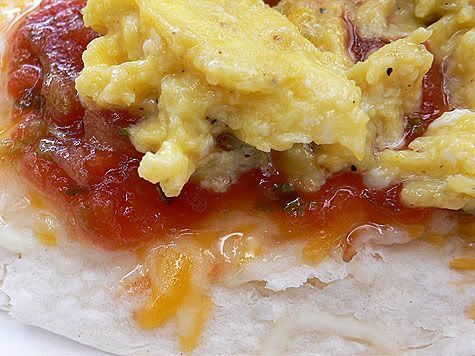 The next morning we had a fortifying breakfast of scrambled eggs in our quesadillas. 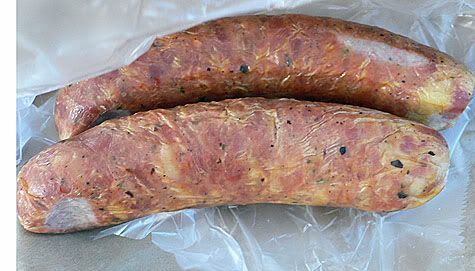 and this delicious Smoked Duck Sausage with juniper berries that had a dense meaty texture and was not greasy at all. 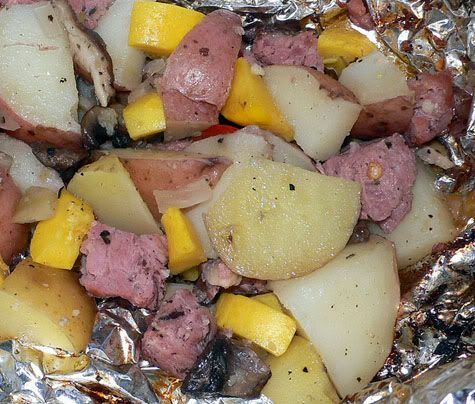 Then assembled in layers with the taters, sausage, olive oil, butter, thyme, a couple of bay leaves, salt and pepper. 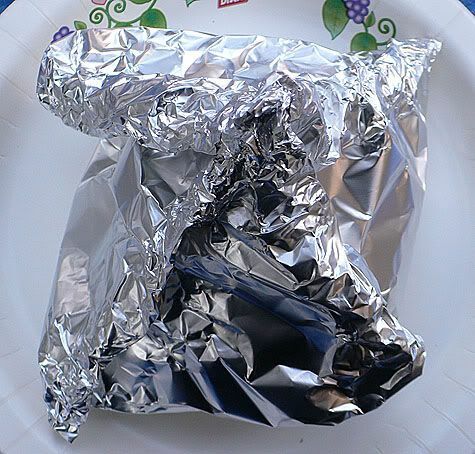 I twisted the foil up in distinctive shapes that can withstand vigorous shaking and turning, while allowing steaming over the fire. 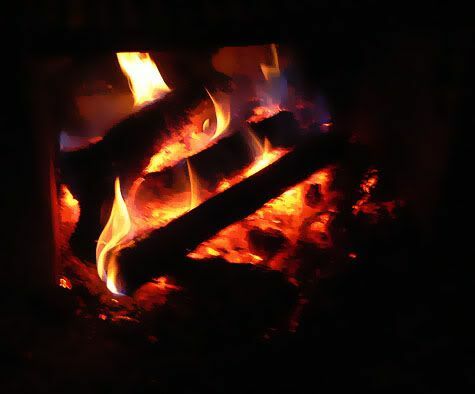 This time we started the fire earlier so had a much larger coal base, but it still took over half an hour (possibly 45 min) for them to cook properly. The smell that rose up when we opened the foil was amazing, and in piggish delight, I finished each packet liberally with butter and extra cranks of black pepper. Another fabulous, engaging read with yummy pictures!!! But I had to smile when I read (I always save soy sauce and hot sauce). — I would like so much to stock up on condiments but over here….even it McD’s, condiments don’t seem to exist! That you OWN a spork reveals that you are a true nature-lover inside! 🙂 Your photos and posts never cease to amaze me. 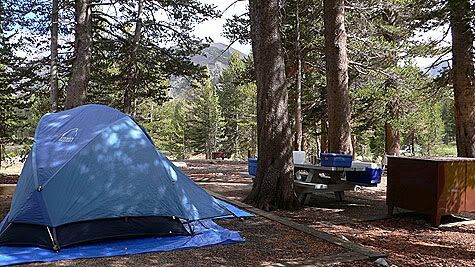 Next time I am camping, I am inviting YOU and Mr. K! Unfortunately, I didn’t get to check out the Pellegrino prix fixe when I arrived in New Orleans, but thanks for taking me along virtually! 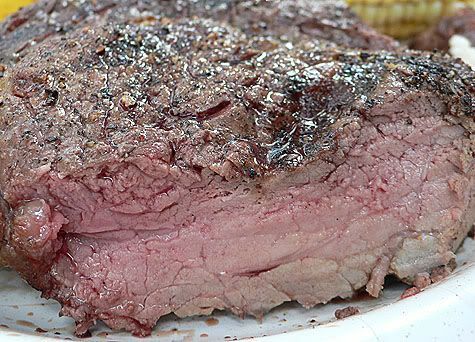 Wow, those chunks of beef looked huge and delicious! 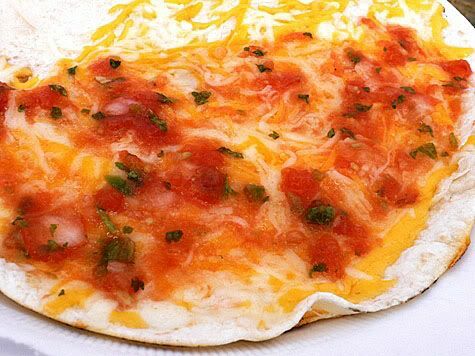 I liked your impromptu quesadillas! They looked good. I’m like you, I’m more a car camper. But at least you were able to make some great basic meals! Yummy. PE yes not only that but it is made of titanium, I think that means it is indestructible and will outlast me! Singleguy, I probably cooked more that weekend than I have in a while! It was a lot of fun. That’s not just any spork. That’s a Snow Peak Titanium Spork, of which I too am a proud owner.